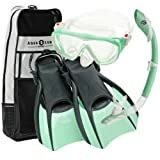 This Aqua Lung snorkeling set is perfect for woman looking to start out on their first snorkeling adventure and advanced enough for those who have been snorkeling already and are looking for a quality snorkeling set. We’ve found that the fits are true and that each every part does what it’s supposed to do: the mask seals on the face, the dry snorkel keeps the water out of the tube whether above the water or submersed, the trek fins pack nicely and are very versatile, and the carry bag holds the entire set plus some sunscreen, camera, and a rolled towel. A soft, hypoallergenic, silicone skirt around the face ensures that the mask has a tight but comfortable seal. The straps of the mask can get stuck in the hair though, so consider buying some mask strap covers as well. The mask also has a purge valve and is a single lens mask for ultimate visibility under the water. Dry Top pivot technology prevents surface splashes from entering the snorkel. When you submerge the top cover pivots to close and seal the tube from water so that you have to do minimal clearing. However, if water does enter the tube there is a purge valve to clear it. The ergonomic design makes the snorkel tube a treat to use. The fins will work great as snorkeling, swimming, and body-boarding fins. Their shorter size make them great for travel and packing while at the same time give power and propulsion in the water. The snorkel finsare open backed with strong straps so that you’re feet are comfortable without being packed but also remain firmly in place. 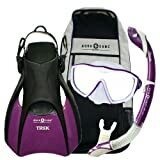 The snorkel bag that comes with the Aqua Lung Diva Set is good enough. We always recommend buying a snorkel bag that is more versatile than what comes with most snorkeling sets, however the bag here is able to carry the entire set as well as a rolled towel, sunscreen, and your snorkeling camera.